The DSR-1500A incorporates the same innovative, high standard technology featured in the DSR-2000 into a compact, half-rack width design. The space-saving size makes the DSR-1500 ideal for such installations as in OB vehicles and with desktop editing systems. A key feature of the DSR-1500 is its recording and playback compatibility of consumer DV (SP mode only) in addition to DVCAM as well as playback capability of DVCPRO 25 Mbps recordings, and its ability to automatically accommodate all standardized cassette sizes without the need for an adapter or changing menu settings. The DSR-1500A comes equipped with a 6-pin i.LINK IEEE 1394 DV I/O connection allowing it to be immediately integrated into non-linear systems with connection compatibility. By configuring the DSR-1500A from either or both of its optional interface boards, it can be equipped to meet a broad range of professional user requirements. There are two optional interface boards available for the DSR-1500. The DSBK-1501 combination SDI/SDTI/AES/EBU interface option board ensures a migration path to and from Digital Betacam, MPEG IMX, Betacam SX and other digital video systems. The DSBK-1504 analog input interface board which includes component, composite and audio connections provide the bridge to existing analog based systems and equipment, and also allows the analog information to be transferred E to E via the standard i.LINK DV I/O connection. PCM Digital Audio The DSR-1500 offers superb PCM digital audio performance with a wide dynamic range and an excellent signal-to-noise ratio. There are two selectable audio recording modes: 2CH mode with 48 kHz/16-bit or 4CH mode with 32 kHz/12-bit. Playback Compatibility with DV (25 Mbps) Format The DSR-1500 offers excellent playback compatibility of DV (25Mbps) format recordings. The DV formats include DVCAM, DV (SP mode only) and DVCPRO 25*. These tapes can be played back and utilized directly as editing materials with +/-0 Frame accuracy. *Playback signal of DVCRO recorded tape is not available via SDTI(QSDI) or i.LINK interfaces. Triple-positioning Cassette Compartment Triple-positioning cassette compartment automatically accepts DVCPRO M-size cassette tapes in addition to standard and mini size cassette tapes of DV, DVCAM and DVCPRO. Cassette insertion is done without the need to attach an external adapter, or without the need to set the playback format mode before use. Compact Size The DSR-1500 is half-rack size, 3U high. With this compact design, the DSR-1500 can be easily installed in a variety of applications. Ideal uses include as an editor/ feeder for desktop nonlinear editing systems, or for installations in confined spaces, such as OB vehicles. Digital Slow Motion and Jog Sound The DSR-1500 offers a variable speed playback function with a range of -0.5 to +0.5 times normal speed. Within this range, the unit can play back digital noiseless slow motion pictures and jog sound. This makes it possible to locate editing points quickly and accurately. This feature is available for all DV (25Mbps) format recorded tapes. Frame Accurate Editing The DSR-1500 is equipped with an RS-422A remote control connection to interface with the other RS-422A equipment. i.LINK based control is also available by installing the optional DSBK-1503 board. Frame accurate editing is possible through either interface. Audio Level Control Audio levels can be adjusted with the control knobs on the front panel in either the record or playback mode. Full Range of Standard Analog Outputs The DSR-1500 is equipped with a comprehensive range of analog output interfaces for both video and audio: composite, component, S-Video (Y/C) for video, and two channels of audio (via XLR connectors) are all standard. *Composite, component or S-Video is selectable through the menu. Digital Interfaces (using DSBK-1501 Digital Input/Output board) The DSBK-1501 option board provides the DSR-1500 with SDI and SDTI (QSDI) digital video and AES/EBU digital audio interfaces. Analog Inputs (using DSBK-1504 analog input board) The DSBK-1504 analog input board provides a full range of analog interfaces: composite, component, S-Video (Y/C) and two channel analog audio (XLR connectors). ClipLink Operation By integrating the DSR-1500 into a non-linear editing (NLE) system which supports ClipLink operation, the VTR is able to send ClipLink information data onto the NLE unit, providing great efficiency throughout the editing process. Process Control (Video Control) The DSR-1500 is equipped with process control for both analog and digital outputs through the VTR menu. This feature helps to provide the unit with highly stable video signals. Composite, S-Video, component and SDI outputs can be controlled with the Process Control. VITC Time Code The DSR-1500 supports both time code in the tape's sub code area, and also VITC through all video signal interfaces. 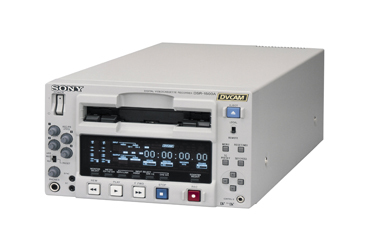 Built-in Signal Generator Equipped with a built-in signal generator, the DSR-1500 can generate color bars or black burst for video, and 1 kHz tone or mute signal for audio. Closed Caption Closed Caption signals can be recorded and played back through analog and SDI interfaces. Control S Interface The Control S (SIRCS) interface enables connection to the DSRM-10 remote controller Unit for remote control, including Jog/Shuttle operation. Picture Search by Menu Keys The DSR-1500 provides a picture search function by use of the menu keys on the front panel. By pressing the left and right buttons, search speed of 10 times normal speed is available both in forward and reverse. The up and down buttons allow frame by frame picture search in forward and reverse. Also, search speed of 0.5 times is possible by continuously pressing these buttons. Universal AC Powering System The DSR-1500 employs a universal powering system to handle AC 100V to 240V, 50 or 60 Hz. The built-in regulator switches the unit to the appropriate voltage automatically. This allows the DSR-1500 to be used worldwide without the need for a transformer. Auto Repeat Function Auto repeat function is available through the VTR menu setting. Designated time code can also be set as start and stop points.